I'm much more Scottish than I am Chinese, if that makes any sense, and it's wonderful to be back in the country where my father was born, even if he did abandon it at a young age to find his fortune in Australia. It's also pretty fantatsic to be on solid ground again, recovering from the rolling North Sea ferry trip from The Netherlands. 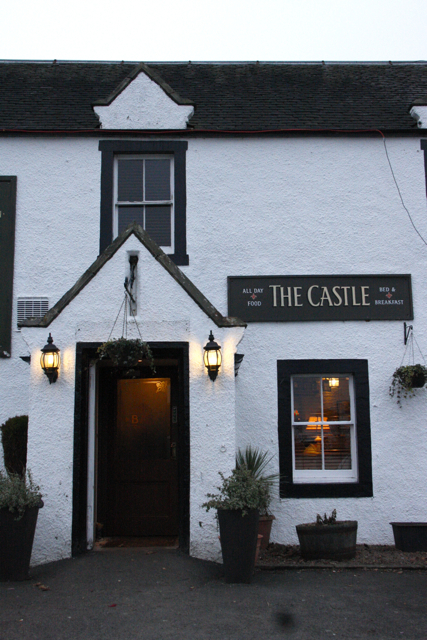 Now that I'm feeling hungry again I'm hankering after a Scottish pub meal, somewhere warm and cosy with great food, and hopefully a fireplace, and there is no better place I know of than The Castle Inn at Dirleton, sitting in the shadow of the 13th Century Dirleton Castle, half an hour east of Edinburgh. 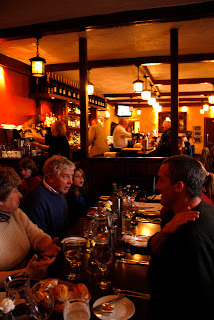 It's a lovely old pub, friendly and welcoming, and unlike some pubs they take their food as seriously as their drink. The owner, Bert, has an impressive commitment to local produce, with Sottish smoked salmon by Dicksons of Port Seton, East Lothian haddock, locally grown duck, Shetland rope-grown mussels, and steak and ale pies with East Lothian Belhaven Best Ale and Anderson's steak all featuring on their well conceived menu. 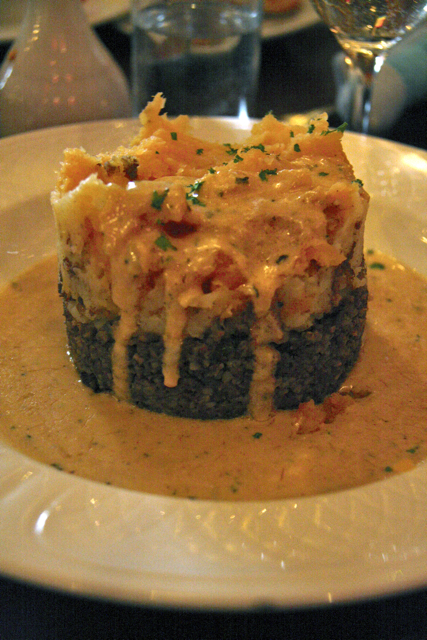 I for one coldn't go past their 'haggis chimney' with neeps and champit potatoes (that's haggis with mashed turnips and buttery mashed potatoes), served with a whisky cream sauce. If you have never tasted haggis, it's not too late. Considered the national dish of Scotland by many, haggis is an intensely savoury concoction made from a sheep's heart, liver and lungs, ground and mixed with toasted oatmeal, onion, suet, spices (black pepper, allspice) and then cooked inside the sheep's stomach. I can sense your skepticism about haggis, given that it's been defamed and maligned by people who have probably never tasted the real thing, but I can tell you, it richly deserves the title of national dish. It's complex, spicy, and savoury and contrasted beautifully with the creamy and buttery potatoes and sauce. 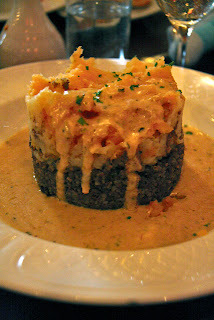 One bite of the Castle Inn's haggis and I had died and gone to haggis heaven. Pretty hard act to follow, but the desert blackboard was offering a traditional Scottish Clootie Dumpling with custard. I could remember my 92 year-old grandmother Maisie talking about clootie dumpling, so I ordered a slice. 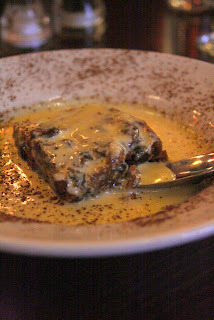 Rich and fruity, like a Christmas pudding without the brandy, it came with hot custard sprinkled with nutmeg. Very delicious. A tot of whisky would have made it taste even better. Later that day I asked Grandma Maisie about her clootie dumpling. 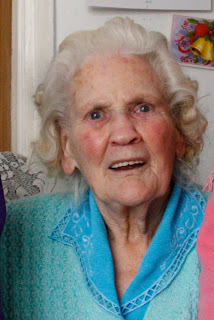 Despite her age her memory is as sharp as ever, and if there's one thing she likes to talk about, it's food (other than her other favouite topic, the evil Tory government). She recalls her mother Tansy cooking the clootie dumpling in a cloot - a cloth - in this instance an old linen pillow case kept specifically for the purpose. Once the fruit dumpling had been steamed for several hours, it could then be sliced and fried in a pan with butter, eaten while hot. She still loves clootie dumpling to this day and was planning a piece for her supper. I knew it was good, but I loved the family story behind it even more.